The modern, multi-coloured plastic water guns are a familiar sight, and you probably wouldn’t be surprised to find out they’ve been around for a while. That said, it might surprise you to learn that records show they likely pre-date the American Civil War, at least in some form or another. The toy gun was made from cast-iron and was threaded through with tubing attached to a squeeze bulb not unlike that of an eyedropper. You would have to fill up the bulb, then squeeze it for the water to come out. Subsequent models used the trigger to squeeze the bulb and make the water shoot out. 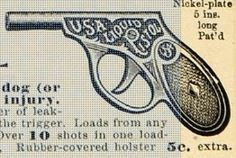 Funny enough, the toy was marketed as an early sort of “pepper spray.” In a 1905 ad, the makers of the USA Liquid Pistol advertised that the gun “will stop the most vicious dog (or man) without permanent injury.” More effective than shooting an attacker with the squirt gun probably would have been throwing the cast iron weapon at the attacker’s head. But nonetheless, this was just the beginning of generations of children’s summer fun. Much later, the cast-iron guns turned into the plastic ones that we know today. Rather than having an eye-dropper-like pouch, they also evolved to work more like spray-bottles. Pull the trigger, and the pressure causes water to come out of the barrel. From here, squirt guns remained largely unchanged until 1977. That’s when the first air-pressure pump water gun went on the market. It was called the Cosmic Liquidator and it worked by pumping air into the gun, building up pressure that was released when the trigger was pulled, resulting in a stream of water. It sounds a lot like the Super Soakers we know today, except that the pressure tank was motorized separate from the gun, connected by a bit of tubing. The batteries to keep the motor running were quite expensive, so it wasn’t the ideal toy. Rather than have a motorized pump, Johnson developed an arm-powered pump like the one you know today. Pumping pressurized the firing chamber, and when the trigger was pulled, the water gun released more water faster than any of its previous counterparts. However, Johnson was only a part-time inventor, which meant that he took a long time to develop the product. Once he did, he was unable to manufacture the gun himself due to limited resources. He decided to seek out a licensing agreement in 1985. Two companies were interested in the product. First, a company called Daisy wanted to take him up on it, but the gun sat on the waiting list for two years while the company underwent organizational restructuring. Afterwards, he sought out Enertech, which already made motorized water guns. He went in with two other inventions, including a water-propelled toy airplane, and mentioned that his gun would blow their guns out of the water, so to speak. After giving them a demonstration, they were ecstatic with the product and decided to take it on. Unfortunately, they were having a rough time selling their toy guns due to a dislike of toy guns that looked like real guns. 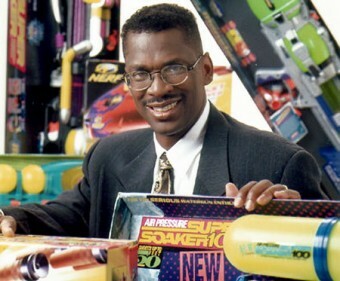 They went out of business before they had a chance to sell Johnson’s new Super Soaker. Finally, Johnson was able to make some adjustments to his prototype and present it to the company Larami in March 1989. The director loved it, and they started designing a prototype to manufacture soon after. The guns were on the market in 1990, and were a “top toy” in the first two years of sales. Johnson patented the product, which had several features—including the bottle water container—that became iconic of all types of water guns. Afterwards, Johnson remained an innovative part of water guns’ future. He and Larami continued to introduce improvements to the original Super Soakers, including larger water reservoirs and different triggers. 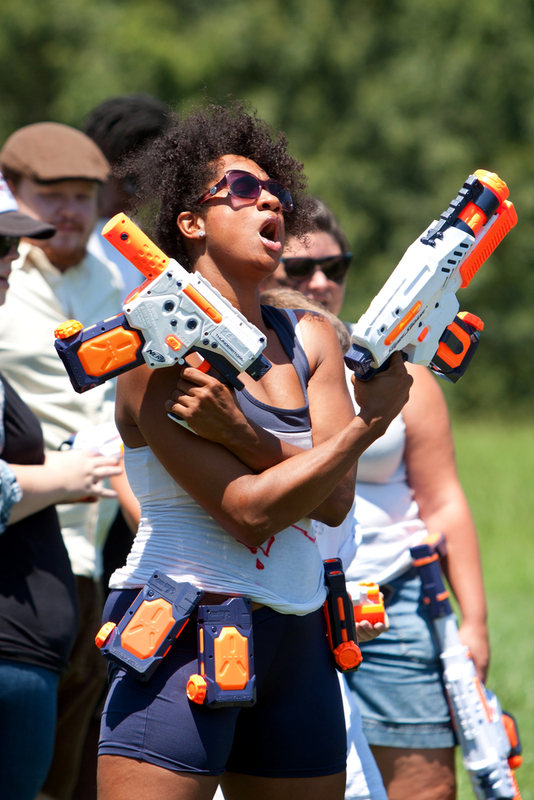 In 2004, Soaker Tag was introduced—a game that involved wearing small target devices which blasted off if they were hit by water, allowing players to see who won and lost the game rather than simply shooting each other until everyone was soaked. In 2010, the Super Soaker line merged with Nerf guns, resulting in additional innovations such as swappable water magazines, rotating nozzles, and tactical rails. Kids don’t know how good they have it these days. WOW. THAT WAS A WHOLE HISTORY IN PERSPECTIVE ON SQUIRT GUN. QUITE INFORMATIVE. TNX EMILY.